While many people make New Year’s resolutions, very few people actually keep those promises. 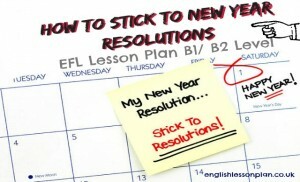 Within this EFL Lesson Plan you’ll be teaching your learners how to make and stick to these resolutions. 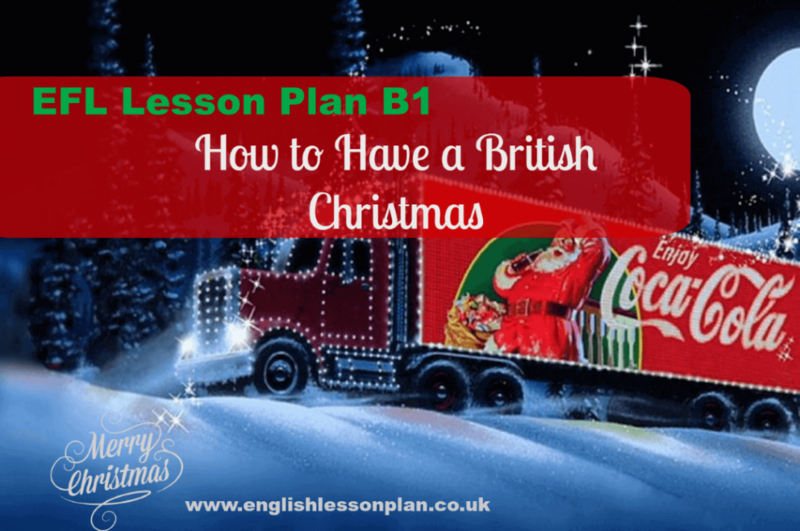 The lesson plan is based on a video which your students are going to watch and later complete exercises concentrated on speaking, listening and reading skills. 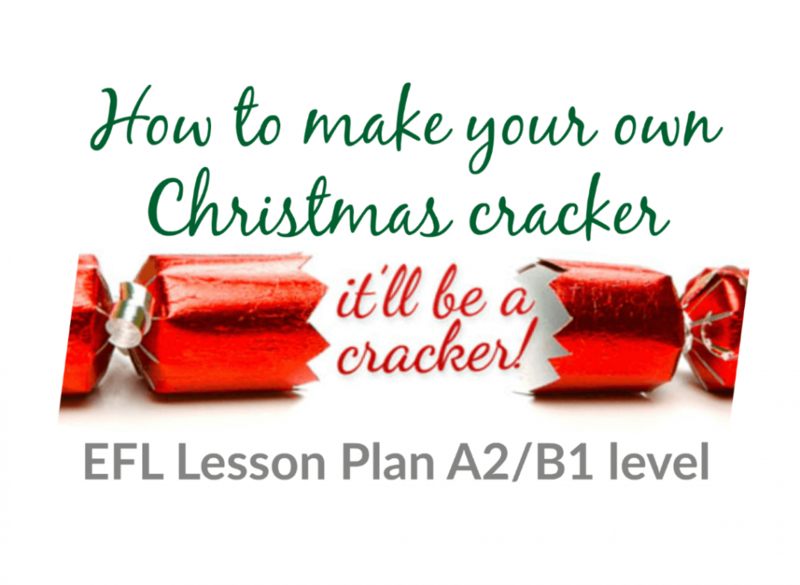 I’m sure your English language learners and yourself will find this lesson inspiring. Greet students and find out how they celebrated the New Year’s Eve- divide students into groups of 4 and ask them to share their experiences. Later elicit some of the answers. Explain that for many people the New Year is associated with New Beginning, and many set new year’s resolutions. 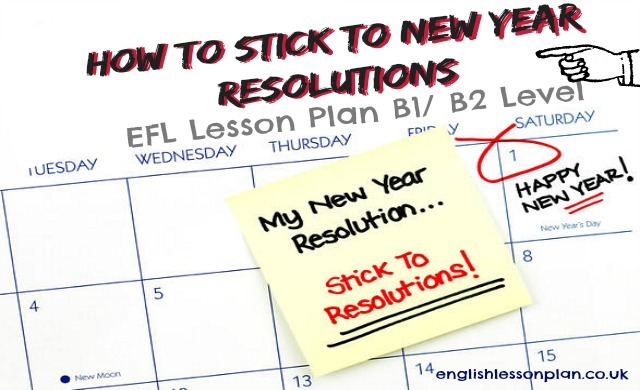 Ask students what do they think New Year’s resolution is, and what the most common resolutions are- group discussion, allow 3-4 mins and later elicit answers. Explain that New Year’s resolutions are a bit like babies: They’re fun to make but extremely difficult to maintain. Distribute worksheet and ask students to do Exercise 1. First students discuss the questions in pairs and later watch the video to find the correct answers. Here are the questions and possible answer to Ex 1. Why is making small changes in our behaviour better than setting ourselves ‘big’ resolutions’? When we start reaching the small changes we set ourselves for success while making the grand resolution we automatically set ourselves for failure. What’s the first rule that helps you stick to resolution and how to implement it? Possible answer: The first rule is ‘Don’t make resolutions you can’t keep’, this means that big resolution requires drastic changes which we can’t keep, so it’s easier to implement a small change and with time increase it. Why did Mrs. Arnold decide to write the book? She was one of the 90% who failed every year. So one year instead of saying she’s going to be somebody different, she decided to do something differently. What does the writer mean by establishing a pattern in our mind. Possible answer: Implementing a micro resolution leads to a change in our mind that affects other areas of life that are relatively similar. 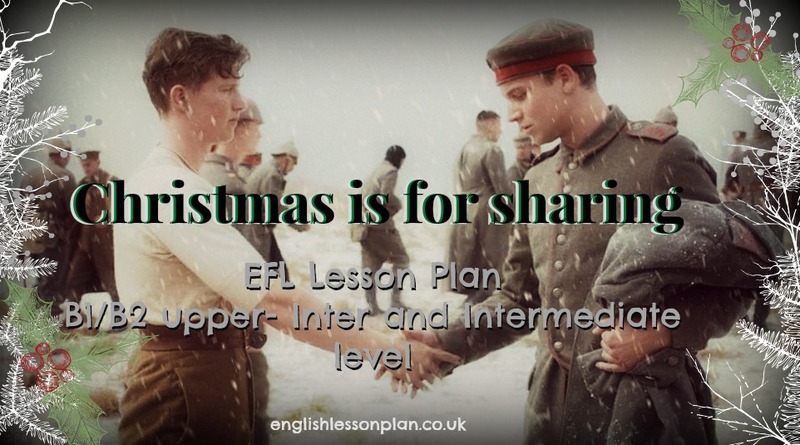 Make sure you allow your students to compare their answers in pairs before checking as a whole class. 1-B We bet you’ve got some New Year’s resolutions you’d like to tackle. 2- C She has come up with a system to help you refocus so that you can nail down the resolutions and get them right the first time. Students work in pairs and discuss the 9 mistakes people do when keeping resolutions ( Exercise 4) allow 5-8 mins and later elicit few answers. The first mistake is that we don’t write our resolutions down. A study done by psychologist Dr. Gail Mathews at Dominican University of California showed that 42 percent of students who had written their resolutions were more likely to achieve them. So next time you’re saying your goal out loud or to your friend, make sure you write it down too. The second one is that we create too many goals. Sometimes we decide we’re going to change our lives, we’re going to get really serious about resolution setting, and we set 20, 25, or even 30 different resolutions in all of these different areas. That’s simply too many. According to an old Chinese proverb “Man who chases two rabbits catches neither.” Ideally set yourself 7-10 goals in total. The third mistake is that we only focus on one area of our lives. It’s very common for us to have goals related to our carers. However, if you’re going to be fully expressed as a human being, if you’re going to become all that you were created to be, you have to set goals in the other areas of your life. Your health, for example, your spiritual life, your marriage, your involvement in the community, career goals. All of those different slices of the pie have to be addressed if you’re going to experience happiness and meaning in your ‘new life’. The next mistake is that we don’t make our resolutions specific. We often say “I want to write a book” or, “I want to study more” or, “I want to learn a new language”. That’s a good intention, but hat’s not specific enough. You might have a goal called ” I want to read more books.” But that’s not really a goal; it’s a dream. But if you say, “I want to read 10 books this year” that’s the kind of specificity we’re looking for. Or you could say, “I want to learn photography.” That’s to general. But to say, “I want to complete the Karl Taylor Photography Masterclass course…” That’s the kind of specificity we need. This actually gives you some kind of parameters to move forward. The fifth mistake is that we don’t make our resolutions measurable. What gets measured gets improved, and to be able to measure it is partly an aspect of specificity, but let me give you an example. If I say, “I want to earn morn money” Well, how much more money? If you said, “I want to convince my boss to give me a 10 percent raise this year” that would have been a measurable goal. So you want it to be something you can measure, something that’s quantifiable, something that makes you able to know when you’ve crossed the finish line. The fact that we don’t assign a due date is the sixth mistake. You have to have a date by which you’re going to accomplish that goal. “I’m going to lose 35 pounds by 1st July ” There are a lot of benefits of deadlines, if we put a deadline on something, then suddenly we’re accountable for it. Sometimes, you may think there’s a part of you that doesn’t want to put a deadline on it, because you can’t foretell what’s going to happen next month or week. There are three main benefits of deadlines, precisely they create a sense of urgency, balance your workload and help you prioritize your daily tasks. The seventh reason we fail when setting resolutions is that we don’t keep them visible. faster than you can process, and you get sidetracked. You soon lose focus on what you said at the beginning of the year mattered most. If the number of things you can do without feeling anxious are few—you’ll either be anxious a lot of the time or miss out on a lot of the excitement life has to offer. Change your frame of mind. View your comfort zone not as a shelter but a prison. Don’t take the safe, known path instead choose challenge over comfort, and set goals that force you to get out of your comfort zone. This is important because if the goal doesn’t stimulate you, you’re not going to put he effort in to accomplish it. Compelling goals are spiritually meaningful, intellectually stimulating, emotionally, energizing, or physically challenging. Resolutions that don’t motivate you, that are just set out of a sense of duty will be quickly forgotten. As a follow-up ask students to write their resolutions for the coming year.